Moneyline betting is a form of wagering where there is no point spread. You are simply picking the winner based on the outcome of the game, moneyline odds can vary wildly depending on the odds in each event. Moneyline betting is not to be confused with moneyline odds, also known as American odds. These odds are commissions attached to a bookmaker’s point spread, moneyline bets are simply taking one side to win straight-up, picking the team who wins outright will win you your bet. Most sportsbooks will offer their users moneyline wagers in addition to point spreads. The odds will be higher when taking a favorite in the matchup, the bettor will be risking more to win less. The odds on the underdog will be a plus wager, the bettor will be risking less to win more. What sports offer moneyline betting? In this baseball matchup, the St. Louis Cardinals are the moneyline favorite. For the bettor to win $100, he will need to wager $150, risking $150 to win $100. If the Patriots lose, the bettor will lose his original stake of $150. 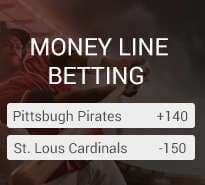 The Pittsburgh Pirates are the moneyline underdog in this matchup. A $100 dollar wager will win the bettor $140, risking $100 to win $140. Again, if the Pirates lose the bettor will lose his original stake of $100. The Patriots are the massive favorite in this matchup, the bettor will have to risk $330 to win 100. The Bills are the underdog, where a $100 wager has the potential payout of $285. Moneyline betting can be tough to tackle for some bettors, but it is truly a balance of risk vs. reward. For instance, a large favorite of -300 or more is most likely to win going to win their matchup but that large price means you’ll be risking a lot for a small payout. On a moneyline bet of -300, you’ll need to win your bet 75% of the time just to break even. When your odds jump even higher to -400, you’ll need to win your bet 80% of the time to show a profit. You are risking a lot to win very little and even though a large favorite will win most of the time, when they do lose, you will find yourself out a lot of money. I try to stay away from large favorite moneylines, because the amount risked is very high and the payoff is low. On the other hand, underdog moneylines can be lucrative wagering opportunities. Upsets happen more often than some of us think and moneyline betting is a great way to take advantage. For example, for a moneyline wager of +250, a bettor will only need to win about 28% of the time to break even and for a +300 wager the bettor would only need to win 25% of the time to break even. If you can spot upsets even decently well, moneyline wagers on underdogs can be profitable bets. In cases when there is a point spread and moneyline offered on an event, such as an NFL football game, many bettors will place a wager on the moneyline and point spread of an underdog they feel has a chance to pull the upset. They will safely bet the point spread because they feel the game will be close, but will also put themselves in line for a nice payday if the underdog wins straight-up. There is no magic formula for moneyline betting, you’ll simply need to pick your spots wisely and balance your risk versus your potential reward. In general, I think this means taking higher upside picks, such as underdogs rather than taking large favorites. However, bettors should analyze each game independently looking for value in both favorite and underdog moneylines.